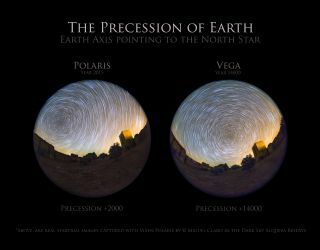 The Earth Precession is captured in stunning detail in this image by astrophotographer Miguel Claro. The Earth's precession is captured in stunning detail in this image by a veteran astrophotographer. In an email to Space.com, night sky photographer Miguel Claro said he developed a new photo technique showing a Vega "polar" star trail. The image was taken from inside the Mourão Castle, in the Dark Sky Alqueva Reserve, the First Starlight Tourism Destination in the world, in Alentejo, Portugal. But what would that look like to future astrophotographers? In a post on his website, Claro explains how he used two star-tracker mountings to help create the views of both Polaris and Vega serving as the North Star in the image above. He also posted a video of the skywatching feat on Vimeo. Claro used a Canon EOS 6D - Canon EF 8-15 f/ 4L Fisheye USM at 8mm (All Sky) at exposure 30 seconds and ISO 2500 to create the images.